There are ham and cheese sandwiches, and then THERE ARE HAM AND CHEESE SANDWICHES. 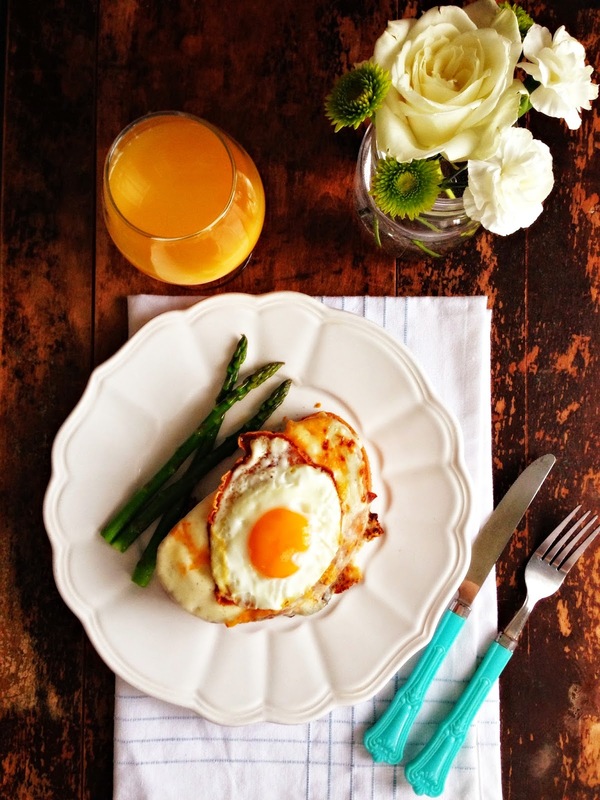 The Croque Madame falls into the latter category. Leave it to the French to gussy up the most basic of sandwiches and turn it into a gorgeous knife and fork affair. 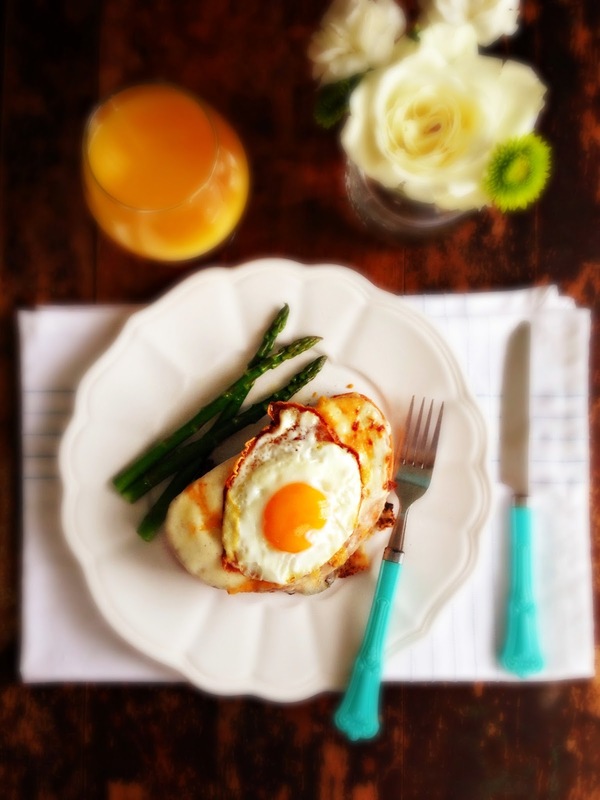 A Croque Madame is basically a grilled ham and cheese sandwich topped with Béchamel sauce and more Gruyère, broiled until golden and bubbly (stop here and it's called a Croque Monsieur). 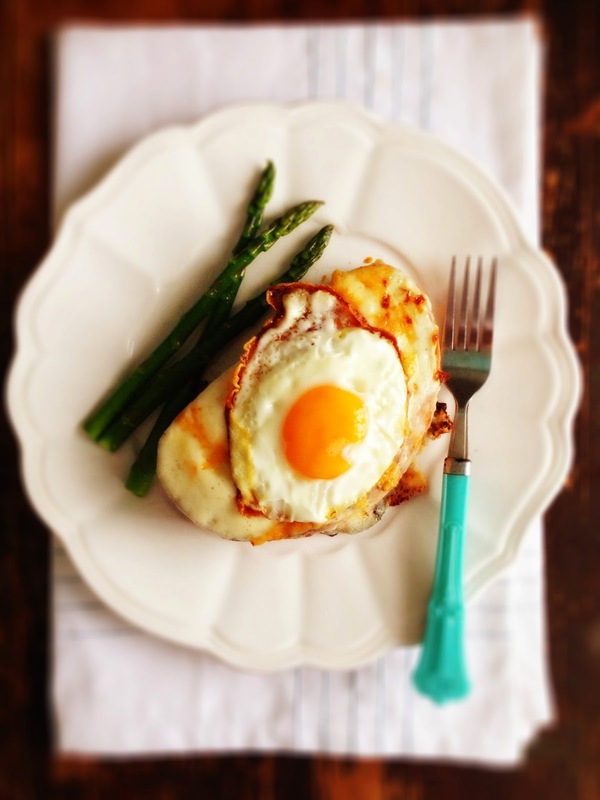 Top it with a perfectly fried egg and it's a Croque Madame. The dome of the yolk apparently resembles the curve of a lady's bonnet, hence the title. Oh, but Mr. and Mrs. Crunch just doesn't sound as appealing in boring ol' English does it? To start, you construct the sandwich between slices of good, country bread slathered with Dijon mustard. You probably already have a bottle of French's in your fridge. If not, then you have my permission to leave now and head to your grocery store for some. Layer in thinly sliced ham (leftover Easter ham would be perfect for this), then top with shredded Gruyère cheese. 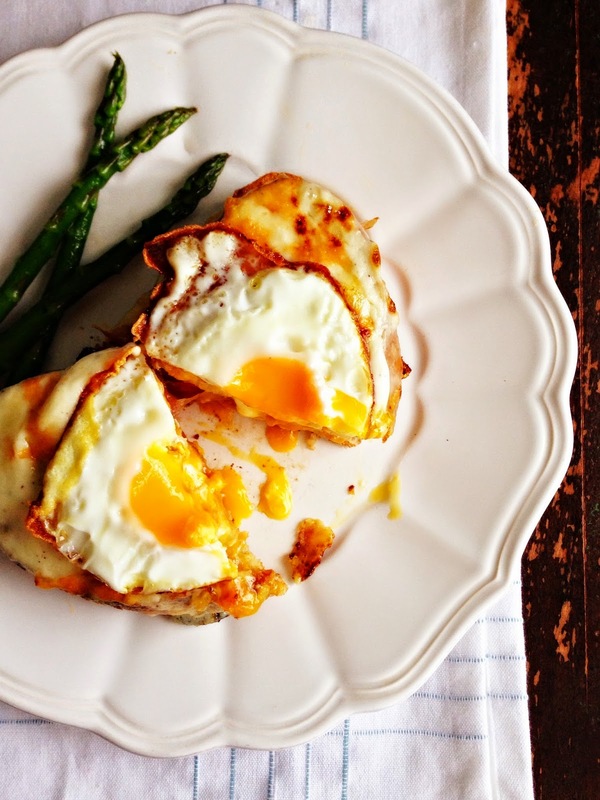 Gruyère is classic, and I urge you to splurge a little, no substitutions. Butter the bread and grill the sandwich like you would grilled cheese style, flipping it over after a couple of minutes and each side is nicely browned. Top it with creamy Dijon Béchamel sauce and more cheese. Broil baby broil. I've fallen in love with frying eggs in olive oil so they get crispy edges and taste like heaven. Top your sandwich with one of these. Inhale, exhale. Tuck in with aforementioned knife and fork. Give a nod to the French for being terribly clever. The flavour of salty ham mingles with the nuttiness of the Gruyère and the zip of Dijon mustard shines throughout the sauce and adds an extra dimension of flavour that really makes this sandwich a showstopper. It's saucy and creamy, yet because we grilled the sandwich first, there are crispy edges and the sandwich has structure. No soggy mess here. Egg yolk is smashed and the golden goodness just puts this sandwich over the top; a perfectly acceptable breakfast or dinner or any time in between. Sauté asparagus on the side just because sometimes it's nice to have something that came from the ground on your plate. Guaranteed you'll never think of ham and cheese sandwiches the same way again. To make Dijon Béchamel Sauce: In a medium saucepan over medium heat, melt butter and whisk in flour. Continue whisking for one minute to cook out the flour. Gradually whisk in the milk and bring to a boil. Reduce heat to medium low and simmer until thick, about 6 minutes, whisking often. Add the Parmesan and Dijon. Season with salt, pepper and nutmeg. Sauce can be prepared and refrigerated up to five days ahead. Butter 4 slices of bread. Flip over and slather bread with Dijon mustard. Top with ham slices and shredded Gruyère, reserving 1/2 cup. Top with remaining bread slices and butter the tops. Heat a large skillet over medium high heat and cook two sandwiches at a time, grilled cheese style, flipping over every 3 minutes until each side is golden. Remove grilled sandwiches to a baking sheet. Repeat with remaining two sandwiches. 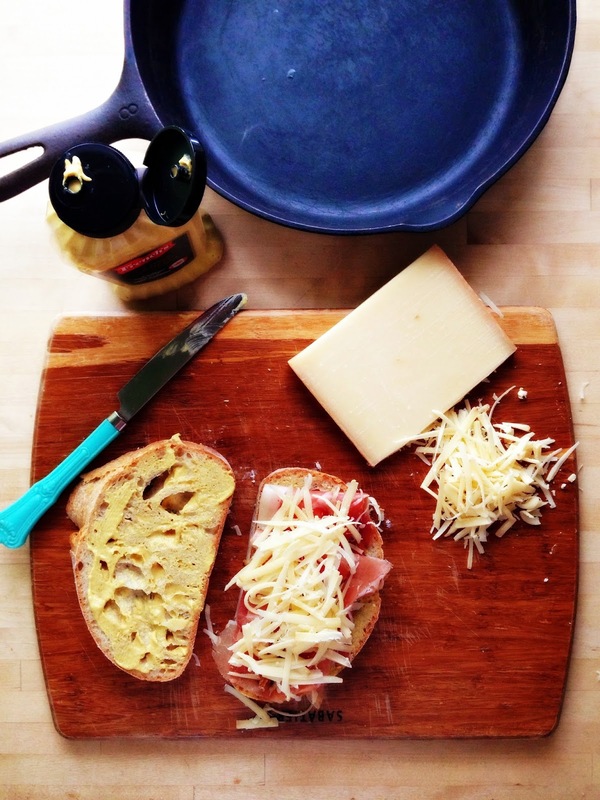 Top each grilled sandwich with heaping spoonfuls of your prepared Dijon Béchamel Sauce. Sprinkle each sandwich with remaining Gruyère. Place under preheated broiler and broil for 3-4 minutes, until cheese is golden and bubbly. Remove from oven. Meanwhile, heat olive oil in large skillet and fry eggs until whites are set and edges are crispy. Season with salt and pepper. Top sandwiches with fried eggs. Devour. Makes 4 sandwiches.